Recently, the National Bank of Switzerland has published the new look of the 200-franc banknote of Switzerland and immediately began the strong reactions of the inhabitants of former Yugoslavia, both in the diaspora and in the respective countries. As the image of the new banknote has been made public, many social network users have reacted to the three fingers raised in this banknote. "Is it about a Serbian banknote," wrote a user in the Instagram of the Swiss daily "20 Minuten". "I think this is a provocation against Albanians, not against Bosniaks?" Wrote another user at Instagram. Most agree that the 200-franc banknotes represent the three-fingered Serbian greeting, or at least can be interpreted as such. This greeting originates from the time of the Ottomans and Serbian insurgents against invaders. Today, "the three fingers of Serbia" are a symbol of Serbian national identification. For most residents in Switzerland from the lands of the former Yugoslavia, this banknote recalls the cruel events of the war in the 1990s. The Albanian concern has brought the Swiss Bank's response. "The front shows the universe with the most important elemental particles of the standard physics model particles, known today. 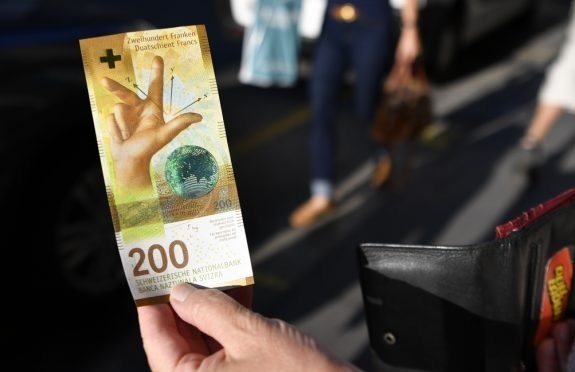 All three hand fingers show three coordinated axes and thus represent the spatial dimensions in which the material is expanded," the Swiss National Bank said in a statement.